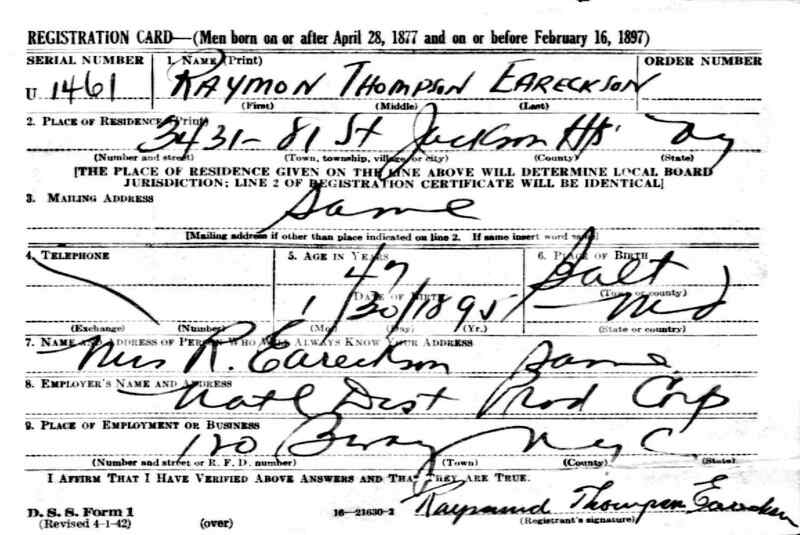 [S204] U.S. World War II Draft Registration Cards, 1942, Ancestry.com, (Name: Ancestry.com Operations, Inc.; Location: Provo, UT, USA; Date: 2010;), Database online. Roll: ; Local board: Jackson Hk , New York. [S176] 1920 United States Federal Census, (Name: National Archives and Records Administration;), Year: 1920; Census Place: Philadelphia Ward 40, Philadelphia, Pennsylvania; Roll: T625_1641; Page: 15B; Enumeration District: 1496; Image: . [S476] Find-A-Grave, Raymond Thompson Eareckson 1953.